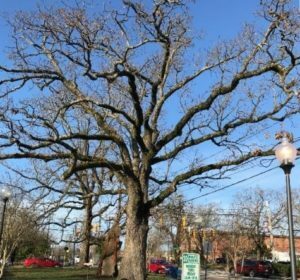 The Post Oak (Quercus stellate) tree that has resided in front of Weaver Street Market in Carrboro for decades — familiarly known as the “Southern Centurion” — has served as shaded canopy to sit under, a meeting place, a starting line and more through its long history as part of the town. But it’s life as a living fixture of Carrboro is coming to an end. Comprehensive analysis of the tree’s root system, trunk and canopy determined that the oak was at significant risk in 2012. The recommended option then was also to remove the tree, but the Town of Carrboro elected instead to prune the tree and monitor the situation. Another investigation was performed in 2016 that returned the same result and subsequent decision. But the 2019 report has shown that the Southern Centurion Post Oak that has so long been a fixture in Carrboro cannot remain. The article misidentifies the tree which the town intends to remove. It’s not the large oak in front of weaver street market, it’s the southernmost of the two oaks by the parking lot across from the century center.